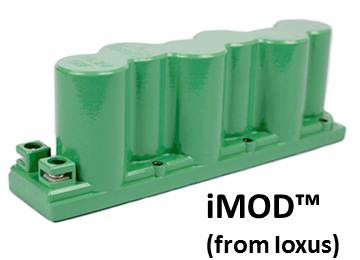 Supercapacitors are electrochemical capacitors with unusually high-energy density — having typically been used to start locomotives, tanks and diesel trucks. Supercapacitors operates by means of static charge capture similar to an electrical charge built up on a carpet that gives you a jolt when you walk on it in dry weather conditions. Supercapacitors hold less electricity than batteries but absorb and release it much more quickly, usually in a matter of seconds. The ability to absorb and release electricity quickly is crucial for time-sensitive electricity storage, including frequency regulation (the moment-to-moment fine-tuning of the power grid), quick vehicle acceleration, and capturing energy from vehicle braking. New technology in development could potentially make supercapacitors with high enough energy density to be an attractive replacement for batteries in all-electric cars and plug-in hybrids. While supercapacitors are related to batteries, they use a different energy storage mechanism. 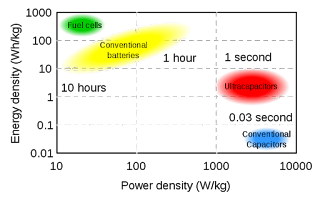 Batteries move charged chemical species (ions) from one electrode via an electrolyte to the second electrode, where they interact chemically. Thus batteries store chemical energy; EDLCs store electrical charge physically, without chemical reactions taking place. Because the charge is stored physically, with no chemical or phase changes taking place, the process is highly reversible and the discharge-charge cycle can be repeated virtually without limit. Typically, an EDLC stores electrical charge in an electrical double layer in an electrode-electrolyte interface of high surface area. Because of the high surface area and the extremely low thickness of the double layer, these devices can have extraordinarily high specific and volumetric capacitances. A striking dissimilarity between batteries and ECs is the number of charge-discharge cycles each can undergo before failure. In contrast, no inherent physical or chemical changes occur in EC electrodes during cycling because the charge is stored electrostatically. As a result, ECs exhibit cycle lifetimes ranging from a few hundred thousand to over one million cycles. Most notably, however, ECs have the ability to deliver an order of magnitude more power than batteries. However, at present, their energy densities are generally lower than those of batteries. As the energy densities of ECs have increased, applications using ECs as EES devices—from vehicles, cell phones, and photocopiers to larger industrial drive systems have increased and in some cases have displaced batteries. Supercapacitors have a higher power density, but lower energy density than batteries. Capa Bus - A traction vehicle that uses supercapacitors to store electricity. Ultracapacitors can charge much faster than batteries, so in vehicles such as buses that have to stop frequently at known points where charging facilities can be provided, energy storage based exclusively on ultracapacitors is viable. China is experimenting with a new form of electric bus, known as Capabus, which runs without continuous overhead lines by using power stored in large onboard EDLCs, which are quickly recharged whenever the vehicle stops at any bus stop (under so-called electric umbrellas), and fully charged in the terminus. The buses have very predictable routes and need to stop regularly every 3 miles (4.8 km) or less, allowing quick recharging at charging stations at bus stops. A collector on the top of the bus rises a few feet and touches an overhead charging line at the stop; within a couple of minutes the ultracapacitor banks stored under the bus seats are fully charged. A capacitor consists of two conductors separated by a non-conductive region. The non-conductive substance is called the dielectric medium, although this may also mean a vacuum or a semiconductor depletion region chemically identical to the conductors. A capacitor is assumed to be self-contained and isolated, with no net electric charge and no influence from an external electric field. The conductors thus contain equal and opposite charges on their facing surfaces, and the dielectric contains an electric field. Capacitance -The ability of a body to hold an electrical charge. Capacitance is also a measure of the amount of electric charge stored (or separated) for a given electric potential. A common form of charge storage device is a two-plate capacitor. Capacitance is directly proportional to the surface area of the conductor plates and inversely proportional to the separation distance between the plates. EDLC - Electric Double-Layer Capacitor (Also known as supercapacitor, supercondenser,electrochemical double layer capacitor, or ultracapacitor) - An electrochemical capacitor with relatively high energy density. Farad - (symbol: F) - The SI derived unit of capacitance. The unit is named after the English physicist Michael Faraday. A farad is the charge in coulombs which a capacitor will accept for the potential across it to change 1 volt. A coulomb is 1 ampere second. Example: A capacitor with capacitance of 47 nF will increase by 1 volt per second with a 47 nA input current. KERS - Kinetic Energy Recovery System - An automotive system for recovering a moving vehicle's kinetic energy under braking. The recovered energy is stored in a reservoir (for example a supercapacitor, flywheel or a battery) for later use under acceleration. Because a supercapacitor can store and rapidly release large amounts of electrical power, it can serve as a buffer between the battery pack and an electric vehicle's motors — improving the vehicle's responsiveness while reducing the charge/discharge cycling that shortens battery life. Supercapacitors may be deployed as buffers on a battery. Researchers at Carnegie Mellon's ChargeCar project calculate that an intelligent electric car controller could recapture 48 percent of the energy during braking. A supercapacitor could reduce 56 percent of the load on the batteries and reduce heating of the batteries — which shortens battery life — by 53 percent. Battery Savings - The number-one cost of electric vehicle ownership is the batteries. Smart power management will save money initially because it pairs a low-cost battery pack with a small supercapacitor. And it will continue to save money by increasing efficiency and extending battery life. High Output Power - Some of the earliest uses were motor startup capacitors for large engines in tanks and submarines, and as the cost has fallen they have started to appear on diesel trucks and railroad locomotives. The railway industry also use supercap for train braking because of the very high power levels. Ultracapacitors have become the power source of choice in wind turbine nacelles, where they power blade pitch control, the positioning of the blade in the wind. hough wind turbine blades are long and awkward to reposition, it is vital to be able to adjust them quickly to allow them to grab useful winds. It is even more vital to quickly get blades turned out of potentially damaging winds. Ultracaps are ideal for such quick bursts of work. Fast Charging - Ability to soak up energy quickly makes them particularly suitable for regenerative braking applications, whereas batteries have difficulty in this application due to slow charging rates. Supercapacitors will be able to recover the energy from many repetitive processes (e.g., braking in cars or descending elevators) that is currently being wasted. Low Self-Discharge Rate - Reliability, on-the-shelf life time of the capacitors are much higher than of any battery type. Starting the engine after a long period of inactivity and under the most unfavorable conditions can be required at any time. High Cycle Life - It has an essentially unlimited charge/discharge cycle life (millions or more compared to 200–1000 for most commercially available rechargeable batteries) This means there are no disposable parts during the whole operating life of the device, which makes the device environmentally friendly. During operation of a hybrid vehicle, energy storage elements are subject to as many as 700,000 stop/start cycles and more than 1 million regenerative storage events. Furthermore a system of this kind has to provide well over 200,000 cycles to support the on-board electrical system for power consumers. On-board electrical systems built to present-day technical and design standards are not able to cope with these kinds of loads over the lifetime of a vehicle. Avoids Battery Disposal - Which is a huge environmental issue Though rechargeable batteries provide some relieve, but still, after 200...1000 (2000 at best) charge-discharge cycles they should be disposed. No corrosive electrolyte and low toxicity of materials improves safety compared to batteries. Improved Safety - Supercaps are mostly immune to the short circuiting and high charge current, thus the charge cycle could be made very short: seconds vs. hours required for the batteries. Wide Operating Temperatures. exhibit temperature stability. extremely low heating levels, Power is unaffected by cold temperatures. Low Energy Density - Supercapacitors need to be much larger than batteries to hold the same charge. Existing commercial electric double-layer capacitors range around 0.5 to 30 Watt Hours/kilo (Wh/kg) Physical constraints on electrode surface area and spacing have limited supercapacitors to an energy storage capacity around 25 times less than a similarly sized lithium-ion battery. Modern lithium-ion batteries are about 160 Wh/kg. Cost - Relatively expensive and only recently began being manufactured in sufficient quantities to become cost-competitive. Research is ongoing to improve performance. For example, an order of magnitude energy density improvement was achieved in the laboratory in mid-2011. Prices are dropping: a 3 kF capacitor that cost $5,000 in 2000 cost $50 in 2011. Variable Voltage - The energy stored in a capacitor is (1/2)CV^2. When you have drained 3/4 or the energy, it is at 1/2 the voltage. Your application needs to tolerate a range of supply voltages. Leakage/Self Discharge - Ultracaps self discharge at about 5% per day. This means that they should not be used in long standby applications, just like flywheels. They are meant rather for applications with numerous charge/discharge cycles, and also where the power/energy ratio is high. Low Maximum Voltage – series connections are needed to obtain higher voltages, and voltage balancing may be required. 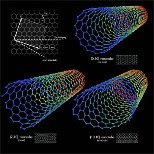 Images of different types of carbon nanotubes. Carbon nanotubes are key to MIT researchers' efforts to improve on ultracapacitors. While supercap energy storage density had more than tripled since 1998 to reach 6 kWh/kg today, new materials and chemical processes are needed to improve their charge storage capabilities by increasing both their energy and their power densities. According to MIT Laboratory for Electromagnetic and Electronic Systems (LEES), Incremental changes in existing technologies will not produce the breakthroughs needed to realize these improvements. Rather, a fundamental understanding of the physical and chemical processes that take place in the EC—including the electrodes, the electrolytes, and especially their interfaces—is needed to design revolutionary concepts. Recent research in electric double-layer capacitors has generally focused on improved materials that offer even higher usable surface areas. Experimental devices developed at MIT replace the charcoal with carbon nanotubes, which have similar charge storage capability as charcoal (which is almost pure carbon) but are mechanically arranged in a much more regular pattern that exposes a much greater suitable surface area. Other teams are experimenting with custom materials made of activated polypyrrole, and even nanotube-impregnated papers. The LEES supercap uses vertically aligned, single-wall carbon nanotubes -- one thirty-thousandth the diameter of a human hair and 100,000 times as long as they are wide. Storage capacity in an supercap is proportional to the surface area of the electrodes. Today's supercaps use electrodes made of activated carbon, which is extremely porous and therefore has a very large surface area. However, the pores in the carbon are irregular in size and shape, which reduces efficiency. The vertically aligned nanotubes in the LEES supercap have a regular shape, and a size that is only several atomic diameters in width. The result is a significantly more effective surface area, which equates to significantly increased storage capacity. ChargeCar Project - Carnegie Mellon University's Robotics Institute, Pittsburgh, PA - Exploring how electric vehicles can be customized to cost-effectively meet an individual's specific commuting needs — and how an electric vehicle's efficiency can be boosted and its battery life extended by using artificial intelligence to manage power. Key to the project is a vehicle architecture called smart power management, which uses artificial intelligence to manage the flow of power between conventional electric car batteries and a supercapacitor. Based on a driver's route and habits, the smart power management system will decide whether to draw power for the electric motors from the batteries or the supercapacitor — and decide where to store electricity produced by the regenerative braking system as the car slows down or goes down a hill. EEStor - Cedar Park, TX - Claimed to have developed a revolutionary new type of capacitor for electricity storage, which EEStor calls 'Electrical Energy Storage Units' (EESU). EEStor claims the EESU can store far more electrical energy than any other type of capacitor, and that it could be used to propel a small car for about 300 miles. This potential for making electric vehicles fully competitive with gasoline-powered vehicles has created much interest, although the company's claims have yet to be verified. EnerG2 - Seattle, WA - Does not make ultracaps. Instead, it makes the activated carbon that goes inside them. Now, a lot of that carbon comes from coconuts. EnerG2 claims it can better control the morphology and pore sizes of the material, which in turn leads to a higher performance electrode. EnerG2 founded in 2003, developed its patented Carbon Technology Platform to enable large-scale production of carbon materials that surpass the limitations of the naturally occurring carbons traditionally used in energy storage applications. Controlling the molecular structure and synthesis of these advanced materials at the earliest production stages provides flexibility, reduced costs, and maximizes performance. Ultracapacitors have become the power source of choice in wind turbine nacelles, where they power blade pitch control, the positioning of the blade in the wind. Ioxus supplies makers of “multiple megawatt turbines, 1.6 megawatts and up,” though confidentiality agreements prevented them from naming the manufacturers. Maxwell (NASDAQ: MXWL) San Diego CA - The far-and-away leader in supercap technology. With strong ties to the electric vehicle and wind markets. Maxwell's largest ultracapacitor market is hybrid electric transit bus drive systems where the ultracapacitors capture braking energy. Nanotek Instruments, Dayton, Ohio - MIT’s Technology Review reports that Nanotek's researchers are developing graphene electrodes which may inspire ultracapacitors with more than five times the energy density of current commercial devices. Ultracapacitors store charge electrostatically with ions from an electrolyte clinging to the electrodes within the capacitor. Through the utilization of graphene (described as atom thick sheets of carbon) Nanotek is able to significantly increase the surface area of the electrodes found within the ultracapacitors. Graphene is able to store a much larger charge as ions are able to layer across the carbon sheet enabling easier attachment and subsequent detachment. This allows for large-scale increases in storage capacity. Nanotek’s tests show that the graphene electrodes could store 85.6 watts of energy per kilogram. Compare that to current ultracapacitors with an energy density of around five to ten watt-hours per kilogram. Sinuatec Automobile Technologies- Arlington, VA - From 2006 - 2010, Sinautec and its Chinese partner Shanghai Aowei Technology Development Company tested, with 17 forty-one seat Ultracap Buses serving the Greater Shanghai area swithout any major technical problems. Buses in the Shanghai pilot were made by Germantown, Tennessee-based Foton America Bus Company. In April 2012, Foton America Bus Company announced it was closing its doors after five years of product design and development. The company, with locations in New Milford, CT and Germantown, TN, was created to develop and deploy alternative fuel buses for the American market, while decreasing incremental costs. Foton America was American owned and operated and had no ties to Foton China except for buying the bus shells. Green Tech Media - Report on Ultracapacitors: Major Advances on Tap. My name is Raj Pamnani . Am with www.rpcapitalgroup.net. We are thinking of investing in a Battery Co. in New York . We need an independent Research report on the company . Can you please call me at 813 858 3584 or email above .